The species lives in Southern and Central Europe up to approximately 54° N, Asia Minor, Caucasus, Transcaucasia, and Western Asia. It is not found in the northwest of France, the Netherlands, Scandinavia, Estonia or Latvia. It is also not found in large parts of Italy and on most Mediterranean islands. Armenia is inhabited by subspecies S.s. melantho (Klug, 1834), which is occupying dry habitats - semideserts, steppes, juniper and mixed woodlands. 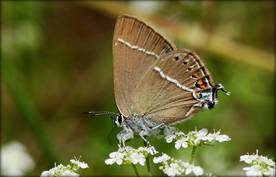 The main host plant of Blue-spot Hairstreak in Armenia is Rhamnus pallasii, although cases of using Rhamnus cathartica at the edges of mixed woodlands have also been observed. The elevation range occupied by the species is between 400 and 2200 m a.s.l. The species is rather common within a typical habitat, and its population trend during 2003-2013 demonstrates stability (p>0.05). As for some other species, the host plant of the Blue-spot Hairstreak is a thorny bush which is useless for livestock to graze (except goats), as well as is useless as fuel-wood. These factors provide some level of resistance to the host plant and therefore to the species. The only threat for the species can come with habitat destruction as a result of large scale business projects, like open-pit mining and development of new arable lands. Also the species demonstrates some local declines in highly grazed areas, which can be result of influence of the overgrazing on plant species diversity, which results in lack of nectar suppliers. The species is not evaluated for IUCN Red List and Red Book of Animals of Armenia; however it was assessed for European Red Book and obtained a status of Least Concern. Also it is not included in CITES and Bern Conventions. Preliminary assessment of the species conservation status suggest it as a Least Concern. In Armenia the distribution range of the species is widely covered by protected areas and Emerald Sites, also the species can be found in in Agarak, Gudemnis, Meghri, Shvanidzor, Gnishik, Ourtsadzor, and Artanish-Shorzha Prime Butterfly Areas. Current population trend of the species and high level resistance of its host plant do not require specific conservation efforts for the species. However, it is important to continue its monitoring to indicate general habitat degradation and availability of nectar suppliers.